Taking place at the Jaguar Land Rover Design and Engineering Centre in Gaydon, Warwickshire, on Tuesday September 9, two competition stages will challenge the competitors’ driving and navigation skills. Teams, made up of a driver and navigator, will compete over a Land Rover all-terrain stage and a Jaguar tarmac track stage. Times from both the stages will be amalgamated to give each team a total time. The four quickest pairs will then qualify for the finals, where they will compete for the first gold, silver and bronze medals of the Invictus Games. The Invictus Games is being organised with the support and backing of The Royal Foundation of The Duke and Duchess of Cambridge and Prince Harry and the Ministry of Defence. It will see more than 400 wounded, injured and sick Servicemen and women, from 14 nations, competing at Queen Elizabeth Olympic Park and the Lee Valley Athletics Centre, thanks to the Mayor of London, the London Legacy Development Corporation and the Lee Valley Regional Park Authority. 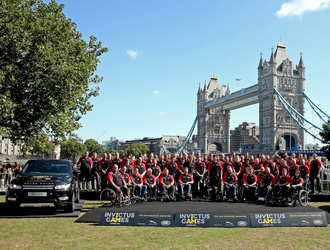 Tickets for the Invictus Games cost £12.85 per person, per session and are on sale at www.invictusgames.org.